We are glad to announce that a new collection of articles on Hegel’s Psychology has lately been published by Routledge thanks to the editing work made by Susanne Hermann-Sinai and Lucia Ziglioli. Hegel’s Philosophical Psychology draws attention to a largely overlooked piece of Hegel’s philosophy: his substantial and philosophically rich treatment of psychology at the end of the Philosophy of Subjective Spirit, which itself belongs to his main work, the Encyclopaedia of the Philosophical Sciences. This volume makes the case that Hegel’s approach to philosophy of mind as developed within this text can make an important contribution to current discussions about mind and subjectivity, and can help clarify the notion of spirit (Geist) within Hegel’s larger philosophical project. Scholars from different schools of Hegelian thought provide a multifaceted overview of Hegel’s Psychology: Part I begins with an overview of Hegel’s Philosophy of Subjective Spirit, which outlines both its historical context and its systematic context within Hegel’s philosophy of subjective spirit. Parts II and III then investigate the individual chapters of the sections on psychology: the theoretical mind and the practical and free mind. 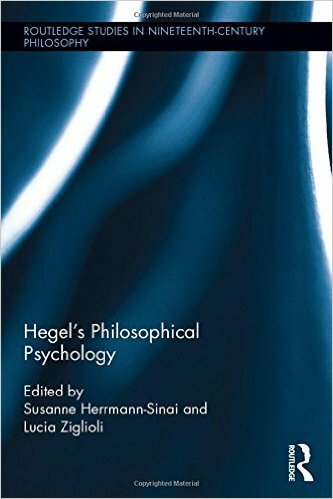 The volume concludes by examining the challenges which Hegel’s Psychology poses for contemporary epistemological debates and the philosophy of psychology. Throughout, the volume brings Hegel’s views into dialogue with 20th– and 21st-century thinkers such as Bergson, Bourdieu, Brandom, Chomsky, Davidson, Freud, McDowell, Sellars, Wittgenstein, and Wollheim. For more details about the book, see here.